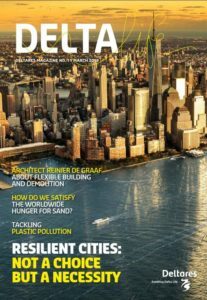 Delta Life is the international magazine of Deltares. The central theme of Delta Life is living in Delta areas. The magazine focusses on developments in the field of flood protection, water availability, water and soil quality and delta infrastructure and planning. The magazine keeps readers informed of the latest trends in these areas. Delta Life is issued twice a year and is available in both Dutch and English. Would you like to receive Delta Life? Send an e-mail to deltares@deltares.nl including your contact details.